This is a rough time to have ties to the Baltimore Ravens. I mean, Tom Brady was doing everything in his power to give the Ravens a spot in the Super Bowl, but they strangely refused to take it. And now that they’re out, Baltimore fans (and, I suspect, many of the players) are upset and left with two guys to blame — Billy Cundiff with the missed kick and, more important, Lee Evans with the go-ahead touchdown drop. The next few days will naturally be filled with hate speech toward these two. (I’d recommend Billy and Lee not return to Baltimore, and instead catch the rest of the Sundance Film Festival, sans Internet, television, or humans who have Internet/televisions.) But the attention of Ravens fans needs to be focused on the good that came out of Sunday’s 23-20 loss. Believe it or not, there are a few reasons for Baltimore fans to forcibly turn that frown upside down. I was watching the game in semi-Patriots territory, and was repeatedly asked why I was rooting for the Ravens. Unaware that speaking ill against the Pats is the easiest way to be fired from Grantland, my only answer was, “Ray Lewis. I love Ray Lewis.” While I’m completely aware of things that may or may not have taken place in a nightclub within the confines of a city that I may or may not be from, in my mind he’s the NFL’s R. Kelly, which gives me permission to proudly state that he’s my favorite player to watch. I love that Lewis is playing with guys who were learning subtraction when he entered the league, but he’s still the leader of the team — both emotionally and by way of production. For the past few years, every upcoming season could have potentially been his last; having him back for one more is a blessing for the Ravens. Deep down, we all know that this historic Ravens defense that has supported a subpar offense for years ends once Ray Ray (and Ed Ed) leave, so it’s great news to know the era is extended. When you lose, you hope it’s to the best. In this case, the Ravens have done that, because it’s not like the Giants are winning the Super Bowl. That’d be silly. 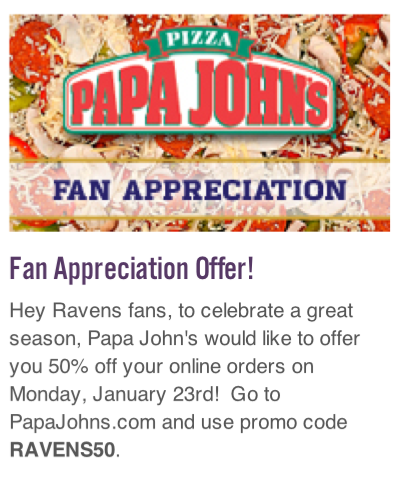 Being the humanitarian that he is, the man they call “Papa John” is offering 50 percent off online orders TODAY if you enter the promo code “RAVENS50.” The catch is that you have to be a Ravens fan to enter that code, which is Papa’s way of really showing that he cares about the city of Baltimore. Sure, outside of these four things, there isn’t a single thing for Baltimore fans to be even remotely happy about, but if they print out this list, throw it under a magnet on the fridge, and read it aloud 20 times a day, they should be able to make it through this dark time. Never forget the good that is in store, long term (Ray Ray’s back) and short term (PIZZA PARTY).